I’m the general dogsbody, aka president for my guild. Finally got the pictures from our December meeting put on-line. My ugly Christmas sweater quilt that I made last year, and blogged about HERE, inspired some copycats, and I couldn’t be more thrilled about it. L-R: Pam, Gaye, Kim, Tracy, Lisa with their versions. The ladies are in a sewing group together and made all the quilts as a round-robin/row by row mash up. I am so tickled that they did their own versions of my idea. Long live the ugly Christmas sweater quilt! Welcome to my blog! It’s a new blog and a modest one at that, but you’ll find that I work hard to quilt every day. This is where I record progress, triumphs, and sometimes failures. 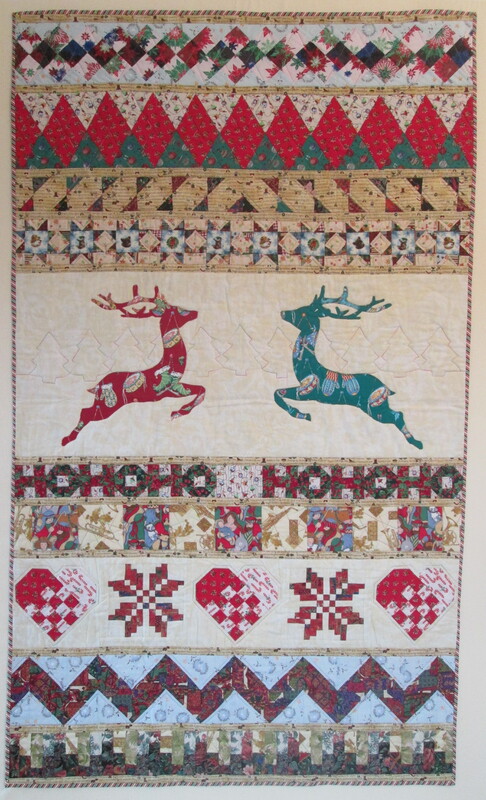 Right now I’m sharing a triumph in the blogger’s quilt festival – original design category. This quilt makes me happy. So very happy. 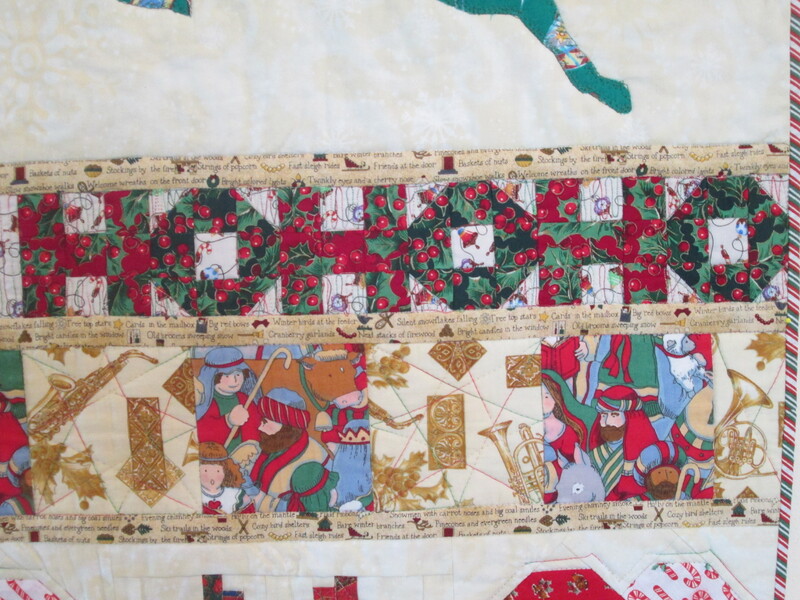 And it has a great story too, which always makes a quilt better I think. Every year in my city the Rotary Club hosts a massive community garage sale fundraiser. Three years ago I found two grocery/carrier bags full of fabric and quilt blocks. I asked the bored teenager “how much?”… Shrug…”2 dollars?” “YES PLEASE!” Inside were a few pieces of excellent fabric, some snail trail blocks done in polyester solids and calicos, and some of the ugliest Christmas fabric I had ever seen. And so the idea was hatched to make….an ugly Christmas sweater-style quilt. 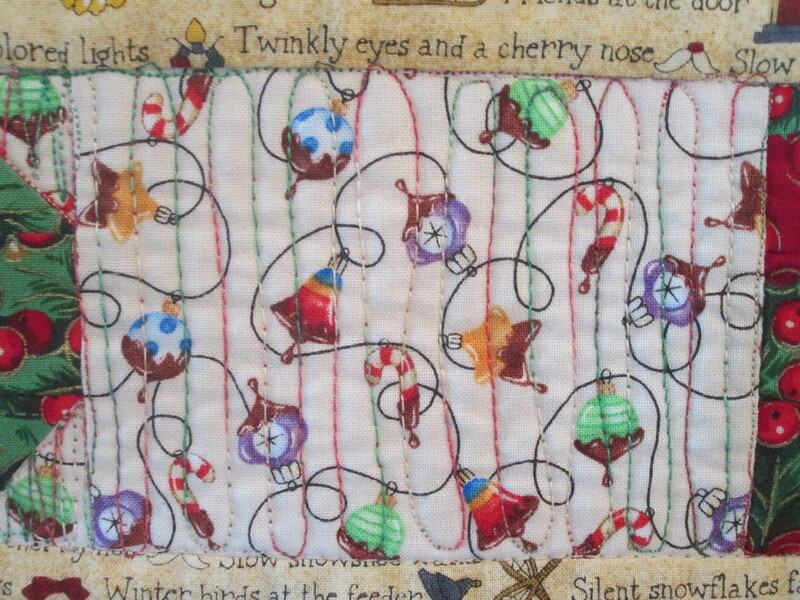 I tried out Seminole Patchwork for some of the rows, fussy cutting, paper piecing, and more. I tried to include many elements of Fair Isle sweaters, ugly sweaters, and Christmas crafts (the snowflakes and the Swedish Hearts). Here are close-ups and commentary for some of my favourite bits. Seriously, wtf were they thinking with these two fabrics? Nordic mittens, native drums, and elf ice skates? Who designed it and who approved it? NB: the quilting is bad on purpose. Background has snowflakes swirling in a beige vortex. Two of my favourite fabrics: (L) brass instruments, saxophones (which are NOT a brass instrument), Celtic-y things, and holly. In gold. 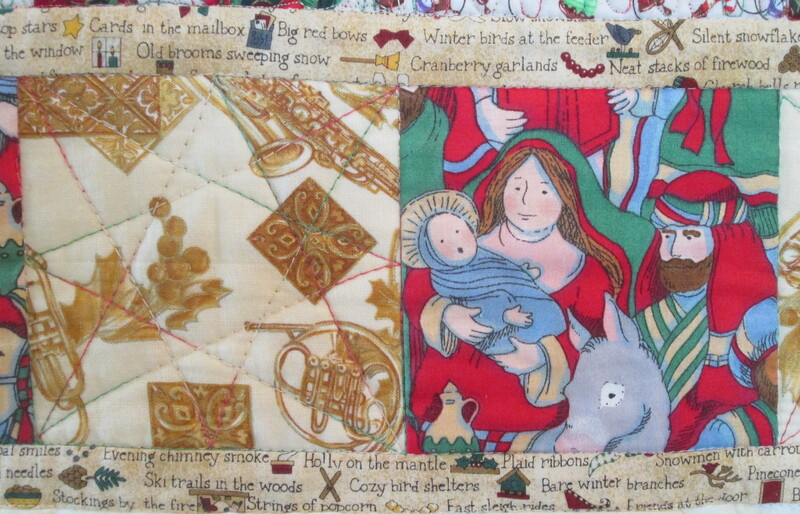 (R) Nativity scene fabric. The least said about that, the better. Cute fabric, nice colours. But why would a string of holiday ornaments be dripping chocolate? WHY? Can’t be Christmas without a little ho ho ho! This fabric was awesome! It had these little heads inside a snowflake, floating on a blue background with white dots. Pictured are the snowman and cardinal. There was also a cross-eyed bear and a fawn. The star points and backgrounds fabrics are colours I thought were kind of yucky. And remember, bad quilting on purpose! Something this ugly and distasteful needed an excellent backing to redeem it. So I went with the only choice, “Hurry Down the Chimney” fabric by Alexander Henry. And this quilt took a third place (small quilt category) in my guild show earlier this year. 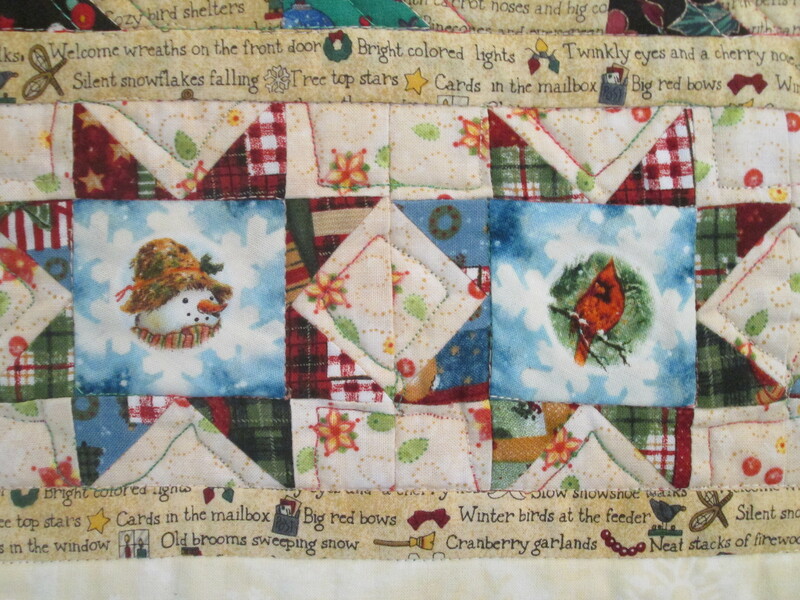 Christmas is coming and I get to use my quilt soon! Thanks for letting me share it with you. Design: Designed by me! Inspired by traditional Fair Isle sweaters, and the current pop culture trend of ugly Christmas sweaters. Fabric: Lots of ugly, vintage, and poorly designed christmas fabrics. 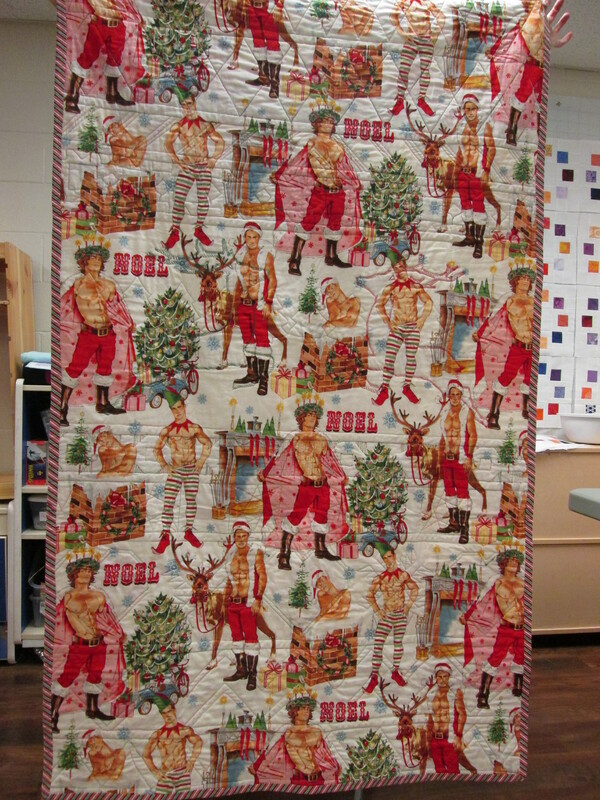 Backing is the wonderful “Hurry Down the Chimney” fabric by Alexander Henry. Quilted: FMQ in 30 wt Sulky variegated red/green/white thread. I am linking up (for the first year ever!) 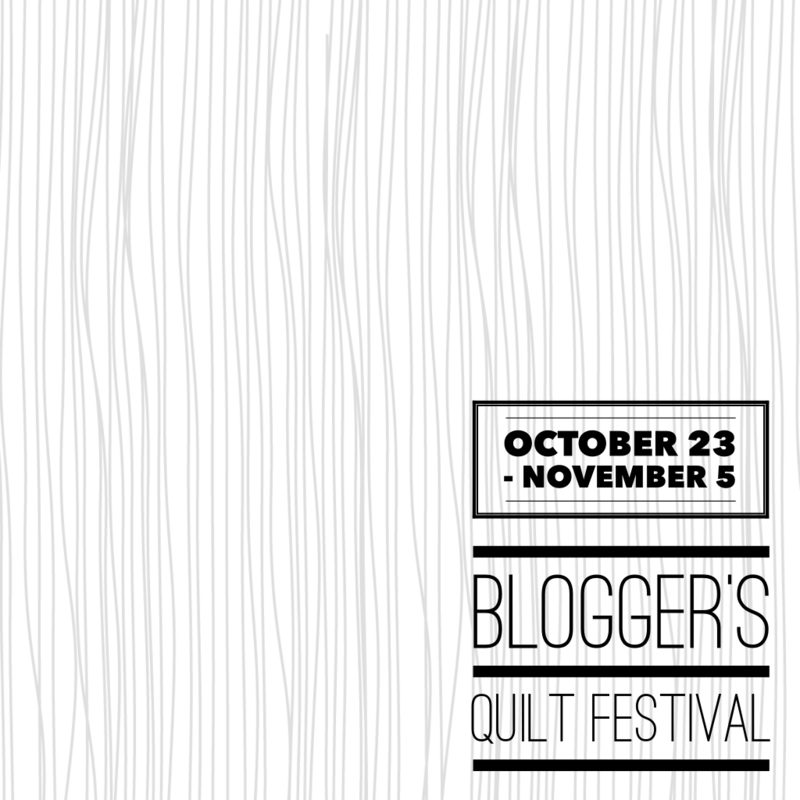 with the fabulous and formidable Blogger’s Quilt Festival, hosted by Amy’s Creative Side.